2017 Snowflakes & Angels Christmas Campaign Launched - Meet Adam! Sometimes the eyes can say more than the mouth. This couldn’t be more true for Adam Skinner. Adam is a 25-year-old son, grandson, brother, nephew, cousin, friend, music fan, movie buff and video gamer. Adam is a loyal and enthusiastic Niagara IceDogs fan and attends many home games to cheer for the team. Adam was born with Cerebral Palsy and is not able to speak. He was referred to Hotel Dieu Shaver Health and Rehabilitation Centre’s Augmentative and Alternative Communication (AAC) Clinic when it opened its doors in 2014. Cerebral palsy is caused by abnormal development or damage to the parts of the brain that control movement, balance and posture. Symptoms include poor coordination, stiff muscles, weak muscles, seizures and tremors. There may be problems with sensation, vision, hearing, swallowing, and speaking. AAC is used by individuals with a wide range of speech and language impairments, including congenital or acquired impairments such as cerebral palsy, intellectual impairment, autism, and Parkinson’s disease. AAC techniques can vary from sign language, writing, communication boards, or speech generating devices. Symbols used in AAC include gestures, pictures, line drawings, letters and words. Pointers, adapted mice, or eye tracking can be used to select target symbols. Even with all these techniques, communication can still be a slow and struggling process. Adam has been a lifelong user of alternative communication. Previously, Adam used facial expressions and head nods to communicate with his parents and two brothers. Adam had a speech generating device, basically a computer that talks, but it was proving to be slow, unreliable and was not meeting his needs. Adam was so frustrated that he surrendered his communication equipment and challenged the AAC team at Hotel Dieu Shaver to find something that did work. Not an easy task considering that he cannot use his hands. Even within the world of using eye gaze devices for communication, Adam eyes don’t work in a typical manner. Patience and belief in a solution was required by both Adam and the staff of Hotel Dieu Shaver. Hotel Dieu Shaver worked tirelessly with Adam for two years to find a communication system that could keep up with him - a system that was both reliable and accurate. Rapid progress in technology, including microcomputers and speech synthesis, have paved the way for communication devices with speech output and multiple options for access to communication for those with physical disabilities. Last year, Adam was set up with an Eye Gaze Edge, a surface tablet with an eye gaze camera and communication software, allowing him to use one eye as a method of control. With a camera focused on the movement of his eye, Adam types letter by letter looking at the keyboard on the screen. Within minutes on the system, Adam typed out, "I want it, when can I have it?!" Now, Adam has earned his online handle "Adam the Wizard," as technology for communication has finally caught up to his needs. Adam uses his eyes to control a computer that acts not only as his voice, but also his connection to family and friends, and his way to the world of information. Adam uses Facebook, texts, sends emails, listens to music - often all at the same time. He sets up movie dates and makes his own appointments. In one year, Adam went from relying on his mother for the coordination of his care and for translation of what he wanted to say, to setting up his own plans with caregivers and friends. Now, his parents Mike and Nancy never know who to expect to stop by their St. Catharines home. 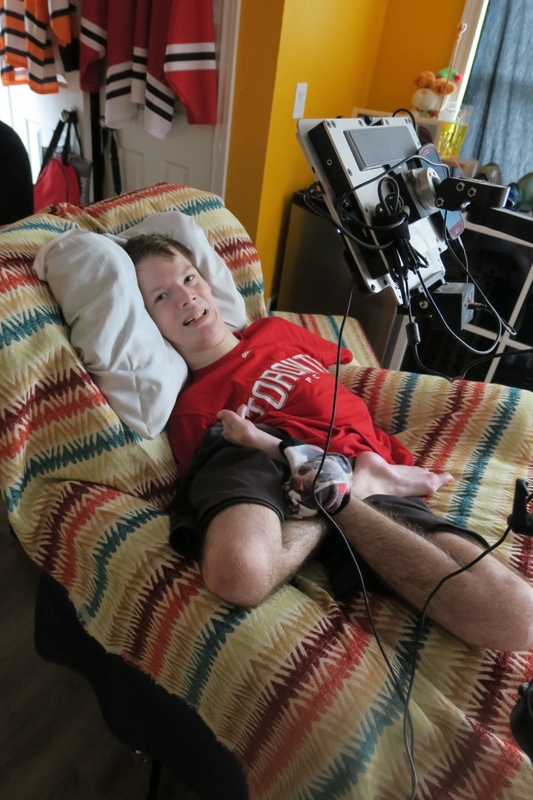 While Adam is physically dependent and requires constant nursing care to address his medical concerns, he is finally able to have his own space and independence. When he needs something - personal care, medical care, or a ride to the movies - Adam can use his AAC device to connect. Through his communication system, doors are opening and social circles are expanding for Adam the Wizard. With the help of the AAC team at Hotel Dieu Shaver, Adam has finally found his voice.